N the run up to Persecuted Churches Sunday on October 26th the Anglican Churches In Abergavenny raised over one thousand pound for the Barnabas Fund. The monies were raised as part of the Harvest Thanksgiving offering. The Fund supports Christians where they are in a minority and suffer discrimination, oppression and persecution as a consequence of their faith. On the Sunday itself the Holywell Community led worship as if we were a ‘secret church’ worshiping in a part of the world where Christians are persecuted. 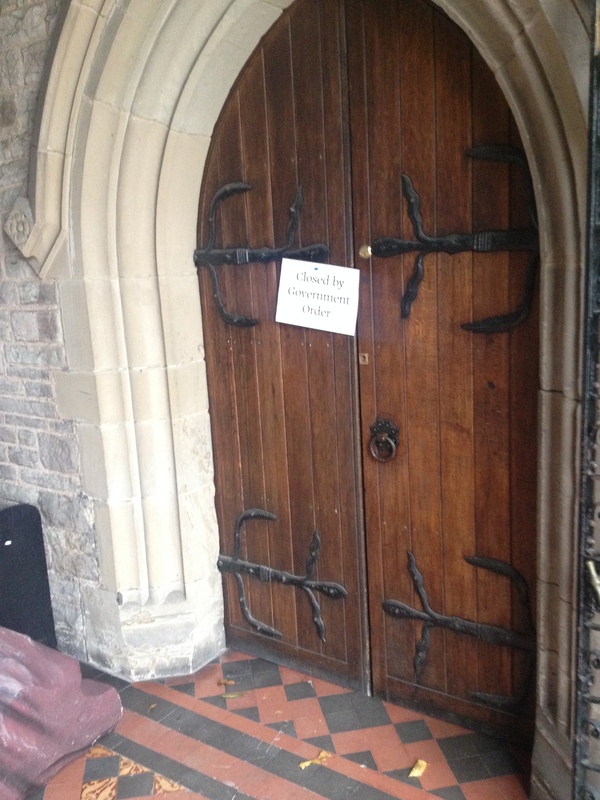 The normal entrance to the church was barred, and worshipers had to follow the sign of the fish to find the entrance to the church whose windows were blacked out to stop preying eyes seeing who and what was inside. 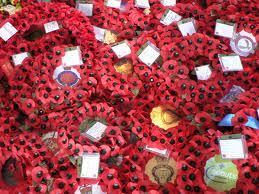 Remembranctide- WE WILL REMEMBER THEM! The Armed Man (A Mass for Peace) by the Welsh composer Karl Jenkins to mark the 100th anniversary of the First World War. Sermon Oct 19th: Render to Caesar…. 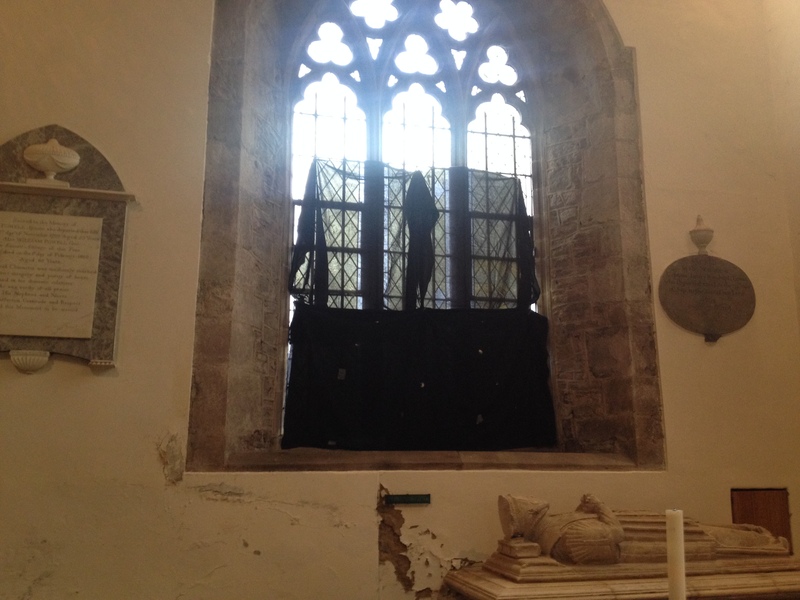 Preaching at St Mary’s Priory on October 19th, following his return from a Pilgrimage in the Steps of St Benedict, Fr Mark reflected on some of the sites he had visited. 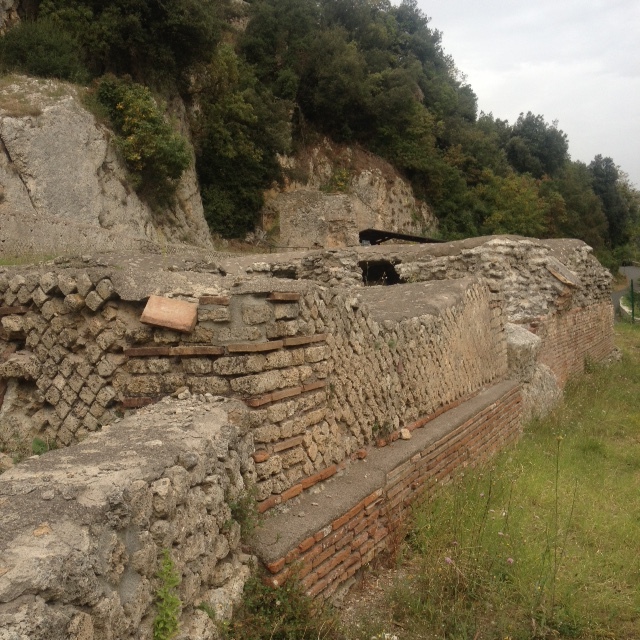 “This week I visited the site of Nero’s Palace at Sabbiaco. The are was so named because Nero had build himself this most magnificent Sub Aquatic Palace. he dammed the local river to make a huge lake and within it build this great edifice – but only ruins now remain. Down the road some kilometres I visited the Abbey Of Monet Casino , three times destroyed, but still standing as a house of prayer and s beacon of the Gospel. The things of Caeasar – the things of this world- are transient, but the things of God are eternal. We need to invest in the later and not the former, but to often we just thing about the here and now, our need at that particular moment in time. 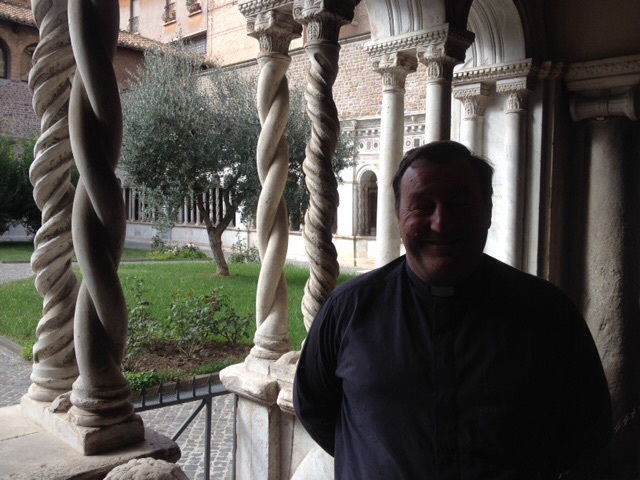 Fr Mark today visited Monte Casino, 5o years to the month after the Pope named St Benedict Patron of Europe. Monte Casino is Benedict’s place of burial, laying has he does along side his sister Scholastica. St Mary’s Priory was part of the ‘Order of St Benedict’. From the tenth to sixteenth century the black monks played an integral part in every aspect of life. She points out that at the heart of the Holy Rule of Benedict is the the use of community.She refered to a film based in Newark USA where despite deprivation a local Bendictine Prep School resulted in more pupils going on to Higher Education. The sense of Community inspired in the school being the key ingredient that leads to success. ses the importance of Community. She pointed out that building up such a community has to be done slowly. 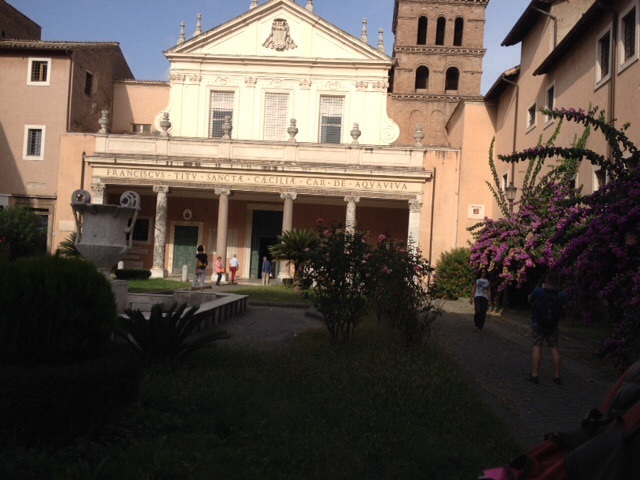 Tuesday we visited St John’s Lateran and the Basilica and Convent of St Cecilia.St Cecilia, the great aunt of Benedict was martyred on the site of the church in her bath. She left her house to the Christians at it became their church. 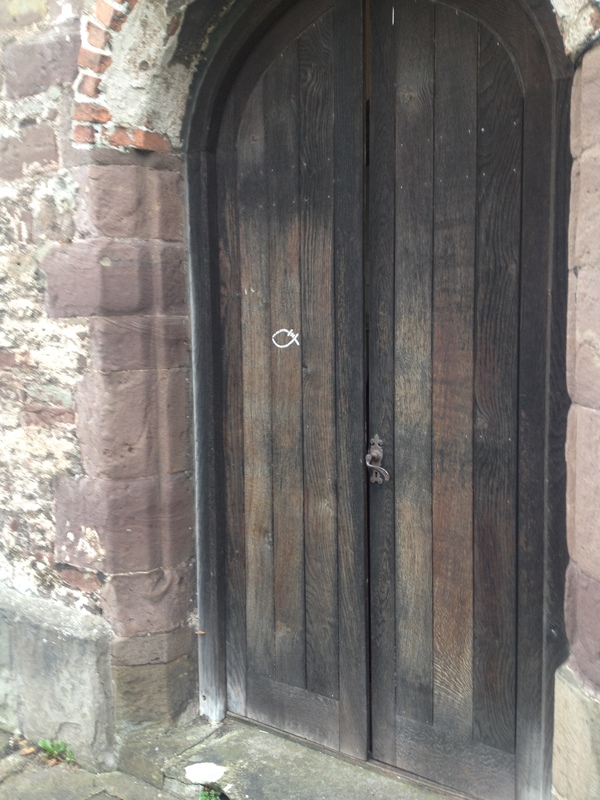 Wednesday saw us visiting some of the early sites in Benedicts monastic life. We noted that his first attempt at leading a Community failed- they tried to poison him because of his Leadership. A good example to all of us embarking on this path, and a further reminder that things take time to learn and develop. We must remember how y oung Benedict was at the time , probably under 20. Prior to that he became a Hermit in a cave at Subiaco. At the site of the cave there is a Chapel where the Monks pray for a United Europe. These prayers are offered around a lamp placed in a bomb case from bombs dropped by the Allies in the Second World War. Fortunately unlike Monte Casino the fact the Monastery was embedded it in the rock saved it and it’s 12 theCentury frescos. Near the site today is St Scholastica’s Abbey which we also visited. Scholastica was of course the sister of Benedict and her self an Abbess. st Schlolastica’s Abbey is the only 1 of the 12 created by Benedict in that valley still in use. Fr Mark Soady, Prior & Vicar of Abergavenny leaves on a pilgrimage in the footsteps of St Benedict, whose rule of life the Holywell Community based her follows. 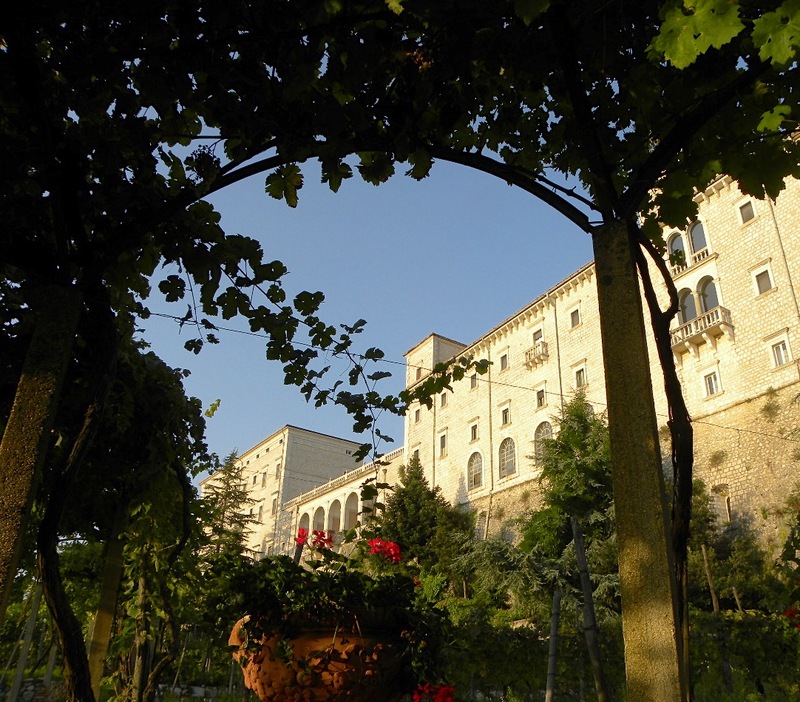 The climax of the Pilgrimage will be to the site of St Benedict’s first Monastery in Italy. 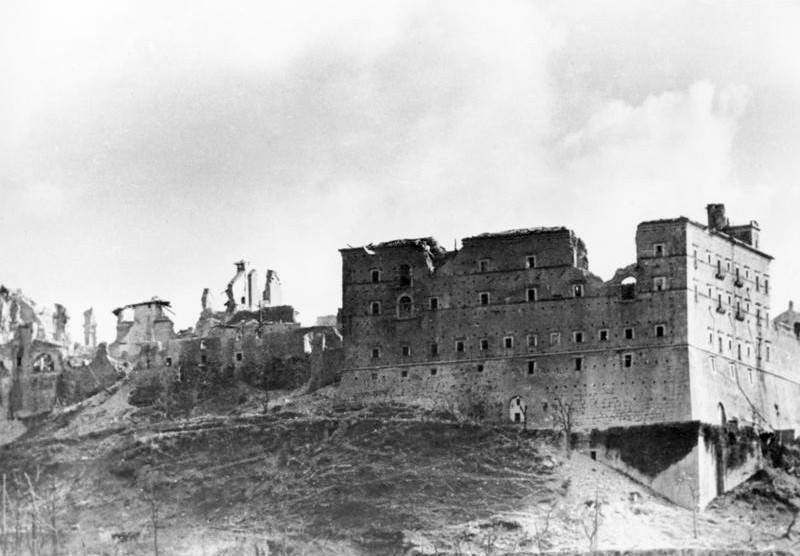 Seventy years ago this year the Monastery was bombed by the Allies to break the Nazi strangle hold on Italy. Within the centuries the Abbey has met magnificence and destruction many times, and has always come out of its ruins stronger. In 577 Langobards destroyed it, then Saracens in 887. In 1349 a violent earthquake occurred and in February 1944 a bombardment almost flatted it. 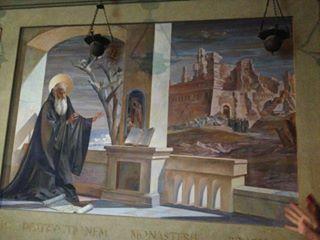 October marks the 50th Anniversary of the Pope declaring St Benedict Patron of Europe. 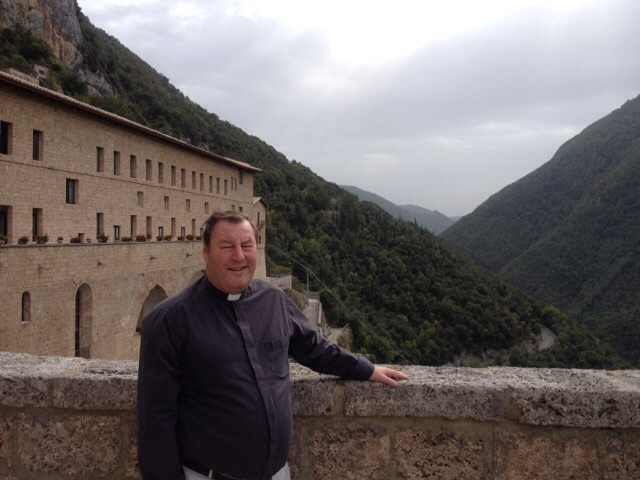 Fr Mark commented, ” It is a double pilgrimage for me, both to the place which saw the start of the Benedictine Monastic tradition, but also to the scene of a World War II battle my Maternal Grandfather fought in 70 years ago”. Fr Mark will also visit Subacio, where at the age of fourteen, Benedict retired from the world and lived for three years in a cave. 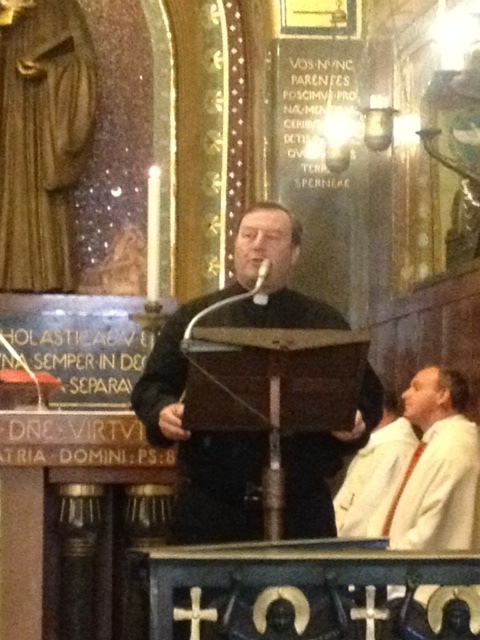 An early afternoon flight from Bristol to Rome and so we arrive in time for an early Evening Mass before Supper. 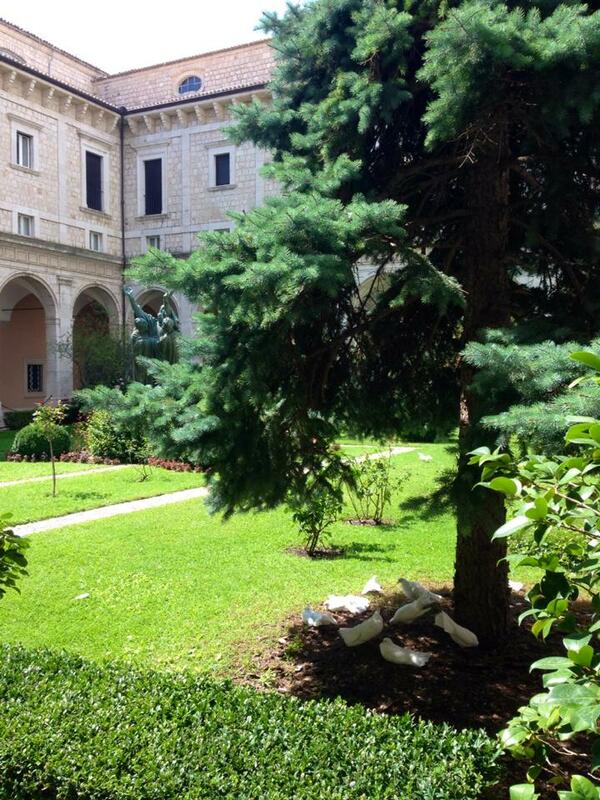 So here we are at Venerable English College’s Villa Palazzola. In a stunning lakeside location just outside Rome, Villa Palazzola is a 13th century Cistercian monastery, fully refurbished and modernised with a large swimming pool and breathtaking garden terrace. The site of Palazzola has a very long history going back to the Bronze Age.Legend has it that Romulus and Remus, the founders of Rome, were suckled by a she-wolf here. 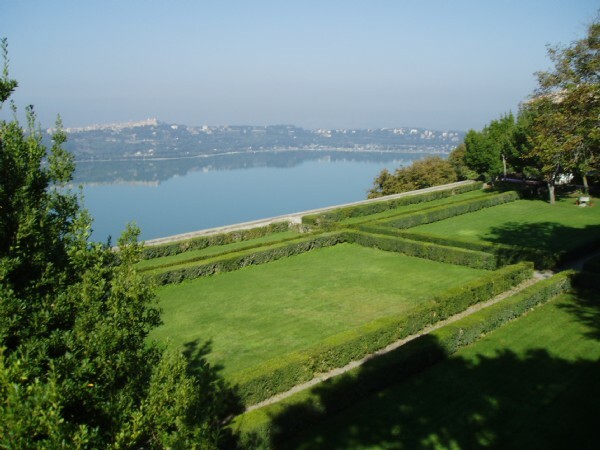 The Romans abandoned their villa on the site around the 4th century and by the 10th century Christian hermits were living in caves on the slopes of the lake. The remains of this early hermitage are still visible. In time the hermits moved into the ruins of Palatiolus and became Augustinians. Cistercians from Tre Fontane Abbey near Rome took over the building in 1244 when it was known as Santa Maria in Palatiolis. There are clear similarities between the Villa church, Our Lady of the Snows, and that of Tre Fontane, especially the roof design and the small rose window. Carthusians replaced the Cistercians who were in turn replaced by Franciscans in the fifteenth century. Some of the very elegant columns from the early cloister can be seen in the windows on the upper corridors of the Old Wing. A Portuguese Franciscan, Jose Maria Fonseca, rebuilt the friary and the church in the 1700s and laid out the garden. 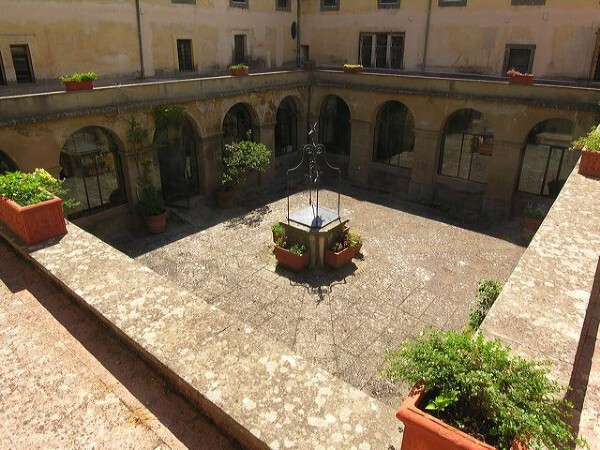 For many years the main entrance to Palazzola was through the large gates now leading to the swimming pool. Two tablets in the cloister record his efforts. Apart from a gap of 20 years the Franciscans remained at Palazzola until the early 20th century.